NEXT BONE BROTH DIET PROGRAM: April 29th - May 19th. Participate from 1 to 3 weeks! Join anytime - as long as you order before the order deadline (at the top of the page). The bone broth diet is a combination of paleo eating and intermittent fasting. 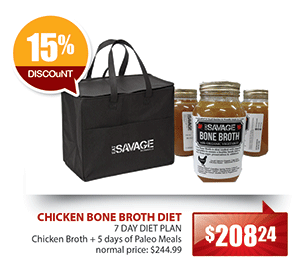 The basic premise is that you eat strict Paleo for 3 weeks while consuming daily amounts of bone broth. It is known for weightloss as well as gut healing. It is also done as a cleanse or body reset to get over a plateau. 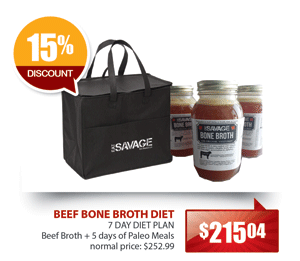 It is broken down as follows: for 5 Days a week- you eat 3 paleo meals a day and drink 1 cup of bone broth. For 2 days a week, you only drink bone broth - about 1.25 litres. On all days you can drink unlimited water and black tea or coffee (dairy is not allowed). Our Eat Savage broth contains fats and protein that do keep you from not feeling like you are starving however if you are having a hard time, a snack of protein and veggies is allowed on the fasting days at 7pm. You can order extra chicken or steak side dishes if you want to have these options on hand - or make your own. 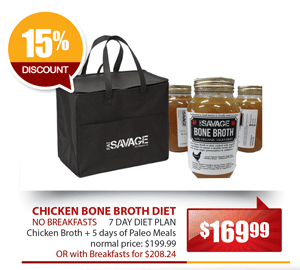 The Eat Savage Bone Broth Diet is available with our Chicken bone broth or Beef bone broth. The choice is a personal preference as both are equally good for the diet. Option 1 - We provide almost everything: In this plan, for the week, you will receive 4 litres of bone broth plus a total of 4 breakfasts (you supply breakfast on Monday), 5 lunches and 5 dinners. Some of these meals will be from the Eat Savage Menu while others will only be available as part of the bone broth diet package. Option 2 - You provide your own breakfasts for the 5 non-fasting days: In this plan, for the week, you will receive 4 litres of bone broth plus a total of 5 lunchs and 5 dinners. Again, some of the meals will be from our menu while others will only be available as part of the bone broth diet program. 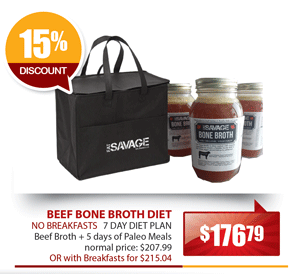 Our first ever Eat Savage Bone Broth Diet program ran from January 7th to January 27th, 2019 and we've been running it off and on since then due to popular demand! We had clients with great success. Some lost 8lbs in a week, others lost 18 lbs over the 3 week plan. Measurements were down 2 to 3 inches and people were even reporting results in lower resting heart rates. We posted some 1 month progress picks in January to our social media pages. We will be running for another 3 weeks - from just after Easter to just before the May long weekend! April 29th to May 19th. You can participate for as many weeks as you want. The bone broth diet isn't set up as a forced subscription so if you want meals for the following week, you will need to order the meal package weekly by the order cutoff deadline. The order cut off is 4pm on Fridays for delivery on Mondays (although if you call us we can ususally accomodate up to 8pm or 9pm on Fridays - 1-855-833-3243). The deliveries will be on Monday's. You are not obligated to sign up for any set time but 3 weeks is recommended to get into the maximum results phase and you can feel free to continue for additional weeks if you have more weight to lose. You can also participate by just ordering the bone broth and by cooking and prepping your own meals (or ordering just a few meals from the Bone Broth Diet Friendly Meal Category - you need a minimum of 4 litres a week. NOTE: Some people drink up to 2 extra litres a week - if you are hungry - you are allowed to drink a cup of broth so you can either make your own or order extra to have on hand just in case. It has a one year shelf life unopened on the counter so it doesn't hurt to have extra. Please remember that in Option 1 - the breakfast on the Mondays will be your responsibility and in Option 2 - you will be responsible for 5 breakfasts. We will send you some examples of approved breakfast options but the easiest is 2 to 3 eggs, about 10 almonds and 1/2 an apple (1 protein serving, 1 fat serving and 1/2 fruit serving). You will then eat the provided Eat Savage meals for lunch (which may arrive late depending on what delivery option you choose) and dinner that day. We have planned out the fasting days to be Wednesdays and Sundays. You can choose any 2 days you want, however, you have to separate the fasting days by at least 1 day. If you are not going to use Wednesday and Sunday, you will need to freeze some of your meals earlier in the week to be edible on Sunday. One Week Plan of Meals & Broth. Normally $244.99 however with our Buy More Save More Program, the cart will automatically discount the total by 15% bringing it to $208.24. You will also get the 15% discount on anything else you order for the week. One Week Plan of Lunch, Dinner & Broth. Normally $199.99 however with our Buy More Save More Program, the cart will automatically discount the total by 15% bringing it to $169.99. Normally $252.99 however with our Buy More Save More Program, the cart will automatically discount the total by 15% bringing it to $215.04. Normally $207.99 however with our Buy More Save More Program, the cart will automatically discount the total by 15% bringing it to $176.79.